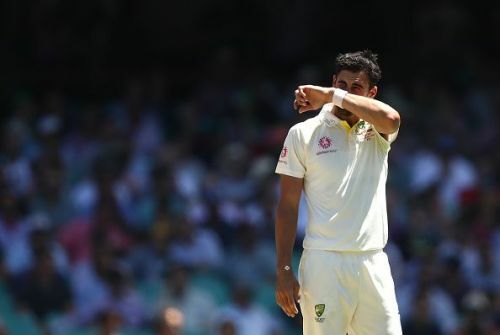 Mitchell Starc, who has been coping a lot of flak for his unflattering performances over the Test series, has received the firm backing of skipper Tim Paine. Unable to rediscover the unplayable swing he generated a few years back, Starc seems to be low on confidence of late. Having taken 13 wickets so far, a tally unlikely going to increase given the slim chances off India batting again, Starc has failed to live up to the general expectations of him. The criticism is unfair to a certain extent, as the general cricket fan expects Starc to steam in and nip the batsman out with searing yorkers or steep bouncers. However, even the most successful fast bowler will admit that such expectations cannot always be met. Also, not just Mitchell Starc, even Josh Hazlewood has been off-colour during the series, capturing 13 wickets. It wouldn't be unfair if he feels he is being made the scapegoat of Australia's ordinary performance with the ball. However, the real matter of worry has been Starc's inability to keep the run-rate in check. Often spraying the ball around the pads, he has been guilty of leaking runs at a premium. While this was always the case with him, the lack of wickets only exemplifies the problem. Among many pundits, Shane Warne, in particular, has been harsh on Starc, severely criticizing him for his ordinary performance, right from the first Test. Starc, however, brushed those aside. Recently, skipper Tim Paine too spoke in support of Starc, saying he continues to work his backside off, but is unable to generate the swing he did a few years back. Continuing that Starc himself understands the need to perform better, Paine underlined Starc's quality, suggesting that he is the best when at his best, but not quite convincing when not. Thus, calling for a bit of patience. "I don't know what people expect from him. His stats for his whole career have been outstanding. When he's at his best, he's brilliant. When he's not, not so much, but he's not running out trying to spray the ball everywhere. That's what I don't get with the criticism he's getting; Mitchell Starc is trying his absolute best to do the same thing he did a year ago when he was swinging the ball around corners. He's down on confidence a little bit and I sometimes think people forget that he's just a bloke who's trying his best. I know he's playing at the highest level and they expect a lot from him but it doesn't always work; it's Test cricket, he's coming up against some very, very good batters and he's not quite at his best," Paine said. For cricket's sake, Starc needs to be at his best, as he is an absolute delight to watch when on song.